Welcome back to week three of Artists' Rights Month at Geek Calligraphy. In week one I pointed out a lot of problems created by the Starving Artist trope, and now I want to provide some solutions. 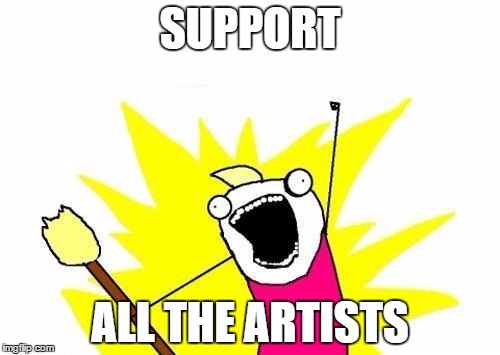 This one should come as no surprise, but one of the best ways to support an artist is to buy their work. Helps us keep the lights on, the rent paid, selves (and families/pets) fed, etc. We like all these things. Buy our stuff and don't attempt to tell us that we should be charging less. We put time and skilled labor into our work, and we set our prices accordingly. Things that go into how we set our prices include, but are not limited to: the difficulty producing the item in question, how many of them we make and whether the process can be made easier if we make more, cost of materials, cost of living while we produce the item in question. We don't set prices arbitrarily high. For some kinds of artists, commissions are extra super awesome! 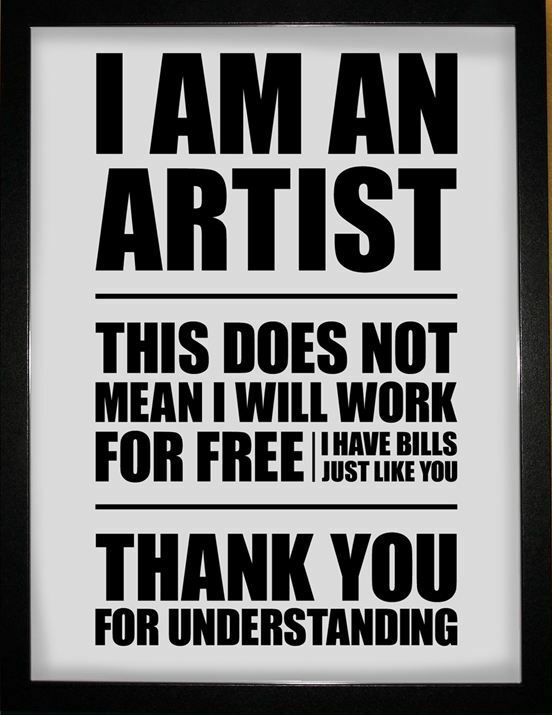 If you think you won't be able to afford it, contact the artist and ask. Be up front about your budget and say that you know they may not be able to produce something in your price range, but you wanted to check. Make it clear that you like their work and respect their skill and their time. If they say no, accept gracefully. But we know that you cannot buy everything all the time. So here are some other ways to help. Creating art can be an exhausting process. Knowing that someone likes it, even if they can't buy it at the moment, can be an enormous pick-me-up. It lets us know that someone sees our stuff and likes it enough to take a moment to send us a kind word. If you see something awesome posted somewhere you should totally re-blog/retweet/Share on Facebook/whatever, but it will help the originator more if you can do it with attribution. This can be hard, because sometimes you see things posted without attribution in the first place. take a moment and hunt the originator down to give them credit. Links back are also helpful, as they boost search rankings. See something awesome and want to use it for your blog/podcast/website? Contact the creator and ask their permission. If they say they want you to pay for it, do so, or don't use it. If they say they don't want you using it even if you offer to pay, respect their wishes. Photographers in particular are frequent victims of this one as Google has made it super easy to search for any image, right click, and stick it somewhere else. I know it's easy, but don't do it. Be a mensch (a good person) and contact the creator before using their work. Re-posting our stuff is great, but please, by all means, signal boost with a comment about how much you like it. Gush to your friends. Maybe one of them is looking for exactly what we're doing right now. This is particularly helpful if you can reach a different audience than the one that the artist might already have in their personal network. If you hear someone reinforcing the Starving Artist trope, don't let it go unremarked. Point out that it is both inaccurate and unhelpful. If you hear someone complaining about how much an artist is charging, not in an "I wish I could afford it" way but in a "How dare they!" way, push back; bonus points if you can do this at work. If you are a creator yourself, portray artists in a variety of circumstances. Honestly, I feel a bit funny about mentioning this one, as it is so much further down on my list of "Problematic Stuff People Say That Should Be Called Out" than say racism, sexism, classism, ableism, xenophobia, etc. But if you have a moment and some spare emotional energy and see the opportunity, go for it. If you are a creator yourself, mentor newbies into your field. I am not saying that you should train them for free, but helping them to get a feel for the ropes can help everyone. If they set their prices too low, it can cut the bottom out of the market for everyone. Remind them that their work is worth paying for!